I'm a member of the #BostikBloggers crafting team, and each month I receive a gorgeous box of crafty goodies to have fun with. 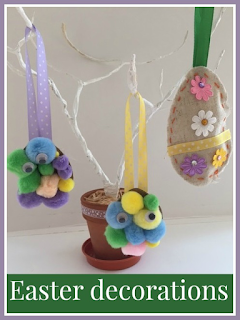 This month the theme was Easter, and having just finished making a lovely new Easter tree I was inspired to use to box to make up some hanging decorations for it. 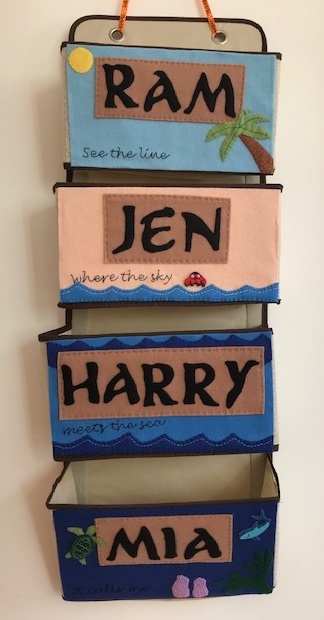 While the children were out at pre-school and school I set up three crafts - first a more complicated one for Harry, then a simpler one for Mia, and another that they could both do together. I felt very organised when they got home and I could present them with their trays of activities! Harry is rather good at sewing, and he loves simple sewing projects. I cut out two Easter Egg shapes for him to stitch together and he chose a bright orange thread. He sewed neatly around the edges and pushed in a small amount of stuffing, then I stitched the opening up firmly and added a ribbon for hanging. To decorate he used some pretty flower stickers and more ribbon. We found that the Bostik glu pen worked really well for attaching the ribbon even though it's really designed for paper and card! This was a super simple craft for Mia while Harry was occupied with his sewing. 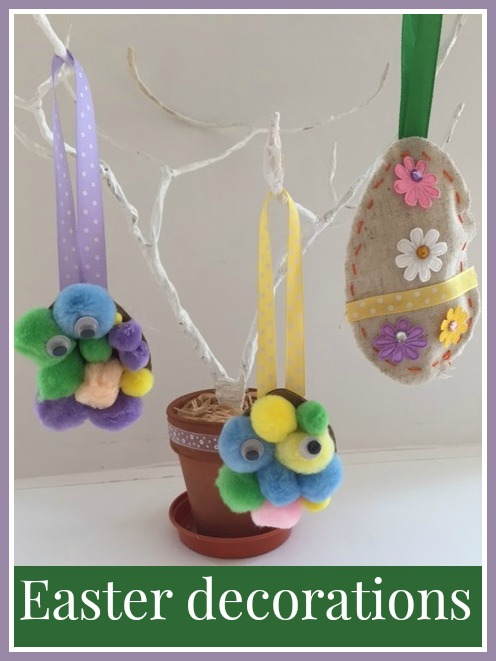 I cut out two small Easter Egg shapes from thick cardboard, and she covered them in a thick layer of PVA white glue and positioned the pom poms on top. When they were dry we added some googly eyes. I used a couple of tape discs to stick some ribbon to the back of the decoration which worked very well on such a light object. Finally both children made some Easter cards for friends and family. They were very simple and quick, but I think they look lovely and cheerful, and both children really thought about how they were going to design and make their cards. They used a piece of A4 pastel card folded over, and decorated with various flower stickers, strips of patterned paper and washi tape, with the glu pen coming in very handy again. I do love Easter and Spring crafting, I'm ready for some warmth after the cold months! Thank you! They really loved making the cards, and I was so proud of their creations! these look great! I always say I'm going to make an easter tree & make cards but it just never happens!